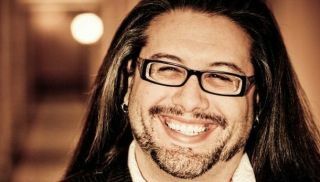 Rest assured that when John Romero plays Doom in Ultra-Violence mode, he dies a lot too. Granted, it's been 22 years since the game released, but it's still comforting to know that the man responsible for designing most of Doom's levels isn't immune from the odd embarrassing death. The video above is the first in a lengthy series of videos featuring John Romero playing Doom, accompanied by Double-Fine's JP LeBreton. The duo touch on most aspects of the game, and there are some fascinating insights into the design decisions at play. If you've spent the last twenty years soaking up all there is to know about Doom there are still a few surprises within. Even if you don't learn anything per se, it's still a lot of fun. It's the latest in Double-Fine's Devs Play series, which has featured Earthbound and The Lion King, among others. We looked at some impressive Doom WADs last week, or, if you'd like to stick closer to the source material, Romero released a bunch of previously-never-seen Doom art late last year.